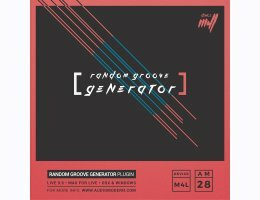 Random Groove Generator PRO is a tool that features four channels that generate pattern sequences for you, you can randomize the steps, pitch, volume, filter, sample point, amount of notes and more. This product is a "Max for Live" plugin and requires Ableton Live. Max For Live puts the vast creative potential of the Max development environment directly inside of Live. It powers a range of instruments and devices in Live Suite. And for those who want to go further, it lets you customize devices, create your own from scratch, and explore another world of devices produced by the Max For Live community.